Wow! Talk about feature rich! This home shows better than the model! Mr/Mrs Clean live here and it's immaculate. You'll be impressed from the moment you arrive. Subtle entrance with hand scraped flooring, hidden office, main floor half bath with marble flooring, massive open concept perfect for entertaining complete with gourmet kitchen. Kitchen has every conceivable upgrade - over sized island with top tier granite, soft close cabinetry throughout the entire home. Living, Dining, and Family flow effortlessly with book end fire features. Built in surround sound up and down. Secondary family room/loft upstairs. Four generous bedrooms. Bathrooms are a model of elegance. Full basement ready for future expansion. 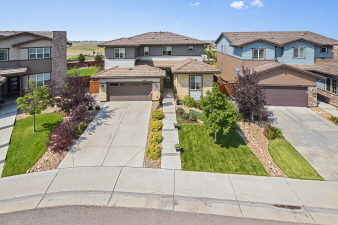 Professionally landscaped yard, water feature, covered patio, & amazing mountain views from big lot. Award winning neighborhood with a strong sense of community. Walking trails abound, pool, community events. Minutes to 25 or quaint downtown Parker. Must see! Hurry it won't last!